Messages Editor is a software solution that can be copied and distributed freely in all media. it may be used completely free of charge. However if you wish to show your appreciation and support its development you can make a donation. Messages Editor is available in two editions: Freeware and Donation. Between these two modes, there is no functional difference. The Donation edition no longer includes display advertising, unlike the Freeware edition. Once your donation made, you will receive a license in a specific file, it is necessary to add license from the Help menu and then selecting the item "Suppress advertising..."
though simple and secure Paypal service. The software supports Windows 7, 8 and 10, including both 32-bit and 64-bit versions. It based on multilanguage Inno Setup free installer. There are two packages under versions of the Microsoft .NET. First one is a stndard installation with traditional setup program. The second one named "toGo" (or 2go) to launch directly Messages Editor program without installation. Both packages are available from Windows 7 and higher. The official Microsoft .NET v4.6.2 is mandatory to run the software. License and Copyright © BLQ-Software. All rights reserved. The Messages Editor solution is a free of charge software: Freeware. It is copyrighted software, not public domain software. 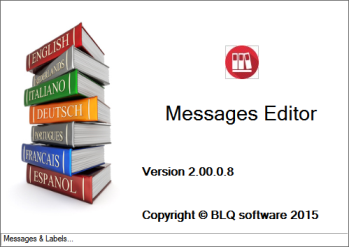 all of the documentation and software included in the "Messages Editor" package is copyrighted by BLQ-SOFTWARE.